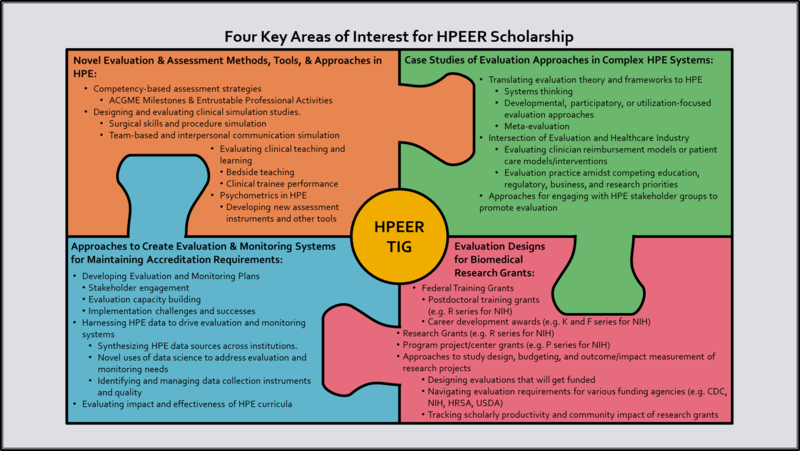 The mission of the Health Professions Education Evaluation and Research (HPEER) TIG is to develop a network of program evaluators working across different areas of health professions education to promote greater evaluation quality, relevance, and use. This TIG will provide ongoing support of HPEER evaluators by providing a forum for developing partnerships, scholarly opportunities, and discourse among practitioners in the field. To this end, the TIG strives to promote inter-professional approaches, identification of best practices in HPE, and provide opportunities for partnerships. Supporting the development of scholarly presentations and publications opportunities among HPEER scholars. Copyright � 2018 Health Professions Education Evaluation and Research. All rights reserved.